So I’ve finished reading The Hobbit. It only took me a few days to read and to be honest, I could have read it it one sitting and the movies still wouldn’t have finished. Peter Jackson has turned a modest 300 page novel into an 8 hour and 40 minute bore fest. So here’s what I liked and disliked about the movie, what could have been better and why I prefer the book. Even Bilbo finds it boring. I’ll get the good points out of the way first so I can then concentrate on what I disliked about it. As always, the CGI was brilliant. You really get a sense that you’re with the characters in Middle Earth and it’s a pleasure to look at. The set-pieces were great, one in particular, the mountain giants fighting each other, was very impressive and won’t be forgetting anytime soon. However, as I write this, everything is coming back to me on what I disliked. The biggest gripe I have with the movie and its sequels is the running time. They’re nearly 3 hours each for God sake! I understand why The Lord of the Rings trilogy had the running time that it did; the pacing in the books was at times unbearably slow and the movies done a great job of speeding up the narrative. But The Hobbit on the other hand flips this around and does the opposite. Splitting The Hobbit into each 3 hour film. 99 pages, 105 pages & 62 pages. I wouldn’t mind so much if there was enough plot to keep me interested but that didn’t seem to be the case. I would’ve been better off sitting down for a full day and reading the book. At least I wouldn’t have to sit through dragged out set-pieces. It’s the one movie that I can remember where I checked my watch every 20 minutes. I couldn’t wait for it to finish so I could get on with the rest of my day. 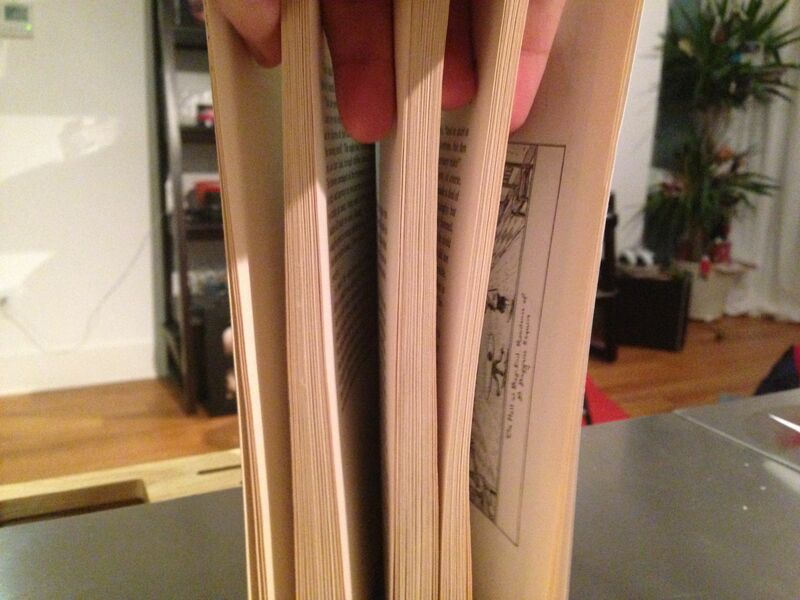 To get a picture of how badly Peter Jackson has milked this franchise, here’s an image taken by reddit user theroboticdan who has divided each movie relative to how many pages they are in the book. Another gimmick Peter Jackson would have everyone believe is high-frame-rate will revolutionise how audiences view cinema. If you’re not familiar with HFR, the movie plays at 48 frames per second, instead of the cinematic 24 frames per second. I thought I’d give HFR a go, because I’m open-minded like that. From the first scene it took my enjoyment away from the movie and instead of admiring the beautiful New Zealand landscape, my attention was drawn to the sets, actors and visual effects rather than the narrative. On occasion I was drawn into the story and the HFR didn’t bother me, like the mountain giants fighting, but once I glanced away from the screen and back again, it took me a few minutes to get back into the story. And this happened more times than I hoped it would. I blame being distracted by the HFR because I’m not used to the look in movies, yet, but 24fps is the standard cinema look and has been used for over 100 years. Actually, hold on, I’m glad I’m accustomed to 24fps because HFR doesn’t belong on the cinema screen. HFR is good for the likes of documentaries and sports events, but cinema isn’t one of them. I had high expectations for the film, hoping it would be another Lord of the Rings trilogy, but warning signs started flashing before I seen the first trailer once I realised they were making a trilogy out of a 300 page children’s book. Here’s a handy info picture on how much The Lord of the Rings trilogy is worth per page and how much The Hobbit is expecting to make in revenue. So, there are my thoughts on The Hobbit. Hopefully the next sequels are much better – I really want them to be because it’s a great story – and they might change my opinion once they’re released. Did you think I was harsh, or did my criticism hit the nail on the head? What were your thoughts on the film? Let me know in the comments below. You’re hitting the nail on the head with the points that I know some others are having with these films. I personally was hoping for something near the way of the LOTR films, but I knew it wasn’t going to be as gritty or dark. I was expecting some slow shire-like peaceful type moments. HFR is still undecided, yeah. I don’t particularly even enjoy 3D (yes I’m that person) but I can appreciate the effort into using these techniques. With that said, I’m not sure the Hobbit was the right adventure into that. I went to see both of them in classic 2D 24fps to begin with so I could simply focus on the story and not the new techniques or 3D added in. Overall, I found the film entertaining at points, but I’m not sure I like them *as* much as LOTR. I didn’t really check my watch so much as anticipate next moments. Playful? Stroll vs. Sprint? Interesting characters? Definitely. Hobbit is quite different, and perhaps longer than we wanted. The idea originally I thought was to add in elements from the appendices. And in both so far, I think the dwarves feel like decently developed individuals, but less so in the 2nd one. I care about the characters, which I think is a good sign. Thanks for your comment, Katie. Yea, I was hoping for something along the lines of LOTR too, but would have enjoyed more peaceful moments because I thought they were a real highlight in the original trilogy, and would have worked well for The Hobbit. I wish I had your idea and went to see it in 24fps and 2d first because I would have enjoyed it more, but I was that disappointed from my first viewing that i avoided it. Yea I think the dwarves are interesting and they did get their fair share of screen-time in part one. Pity they didn’t get as much love in the sequel because they added the much needed comic relief. I’ve yet to see the 2nd outing, but judging from how quickly An Unexpected Journey arrived to Netflix I doubt I’ll have to wait too much longer. One of the main themes in the film’s is hope, and it does it so well because we are the ones who are hoping for something better.